Florida is home to a large number of invasive as well as native species of thrips. Hot temperatures and high humidity are important factors supporting huge populations of thrips in Florida. 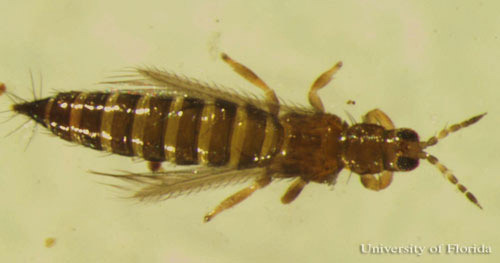 In the genus Frankliniella, the common blossom thrips, Frankliniella schultzei Trybom, is a relatively new vegetable pest in South Florida. It is a key pest in tomato and cucumber fields in South America. Figure 1. Dorsal view of an adult common blossom thrips, Frankliniella schultzei Trybom. Photograph by Vivek Kumar, Entomology and Nematology Department, University of Florida. In Australia, Frankliniella schultzei was earlier known as Frankliniella lycopersici Steele, while in South America it was described as Frankliniella paucispinosa Moulton (Sakimura 1969). 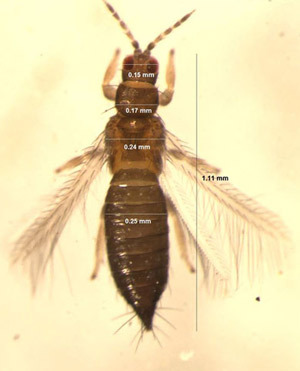 The common blossom thrips has a very wide distribution and is mainly found in tropical and subtropical areas throughout the world (Vierbergen and Mantel 1991). Central America and Caribbean: Barbados, British Virgin Islands, Cuba, Dominican Republic, Haiti, Jamaica, Puerto Rico. North America: United States (central and southern Florida), Colorado, Hawaii. New Guinea in the western Pacific region. Mixed colonies of both color forms are reported by Mound (1968) in Egypt, India, Kenya, Puerto Rico, Sudan, Uganda, and New Guinea. Thrips are a very small insects. 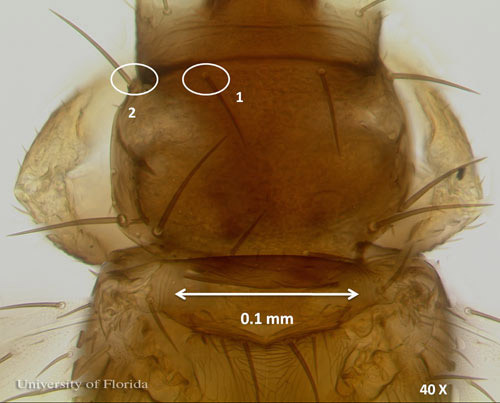 Adult females are 1.1-1.5 mm long, whereas adult males are 1.0-1.6 mm in length. Thrips species usually are identified by body color, body setae and a comb on the 8th abdominal segment. The following text and images describe identifying characteristics of Frankliniella schultzei. Figure 2. Dorsal view of an adult common blossom thrips, Frankliniella schultzei Trybom, with dimensions marked. Photograph by Vivek Kumar, Entomology and Nematology Department, University of Florida. The interocellar setae arise along an imaginary line across the front edges of the two hind ocelli. Figure 3. Head of an adult common blossom thrips, Frankliniella schultzei Trybom, showing interocellar setae at 40 × magnification. Photograph by Garima Kakkar, Entomology and Nematology Department, University of Florida. 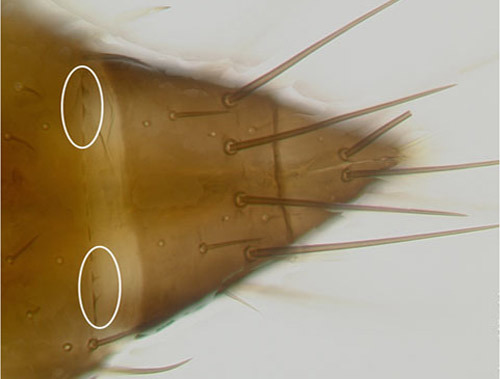 The postocular setae are slightly shorter than interocellar setae on the head of adult female Frankliniella schultzei. Figure 4. Head of an adult common blossom thrips, Frankliniella schultzei Trybom, showing postocular setae (1) smaller than interocellar setae (2) at 40 X magnification. Photograph by Vivek Kumar, Entomology and Nematology Department, University of Florida. The anteromarginal setae are slightly shorter than anteroangular setae on the anterior of the prothorax. Figure 5. Prothorax of an adult common blossom thrips, Frankliniella schultzei Trybom, showing the anteromarginal setae (1) slightly shorter than anteroangular setae (2) on the anterior of the prothorax. Photograph by Garima Kakkar, Entomology and Nematology Department, University of Florida. The abdominal comb is weakly developed on the 8th abdominal segment. Figure 6. Abdomen of an adult common blossom thrips, Frankliniella schultzei Trybom, showing a weakly developed comb on the eight abdominal segment at 40 X magnification. Photograph by Garima Kakkar, Entomology and Nematology Department, University of Florida. There are two larval instars and two inactive and non-feeding stages in the life cycle. The latter two stages are known as prepupa and pupa. Females of Frankliniella schultzei insert their eggs in flower tissue. Silvia et al. (1998) in Brazil studied this thrips life cycle at 24.5°C and reported that a complete generation takes around 12.6 days. The embryonic stage lasts for four days and the 1st and 2nd larval instars, prepupa and pupa take an average of 2.5, 2.5, 1.2, and 2.1 days respectively. The adult female and male longevity is approximately 13 days. Frankliniella schultzei is a polyphagous pest feeding on various ornamental and vegetable hosts in different parts of the world (Milne et al. 1996). It has been recorded from 83 species of plants among 35 families (Palmer 1990). The major hosts of Frankliniella schultzei are cotton, groundnut, beans and pigeon pea. However, due to its polyphagous feeding behavior, Frankliniella schultzei also attacks tomato, sweet potato, coffee, sorghum, chillies, onion and sunflower (Hill 1975). Crops suffering economic damage due to Frankliniella schultzei in different parts of the world include tomato, tobacco, cotton, grain legumes, groundnut and lettuce in India; ladys fingers, thistle, Japanese daisies, irises, spinach, tomato, carnation, pumpkin, carola (Tagates erecta), aubergine and kidney beans in Cuba; Allium sp. (cepa) flowers in the Netherlands; and cotton, tomato, lettuce, pepper, cucumber and tobacco in Brazil. Frankliniella schultzei can cause both direct and indirect damages to crop. Both adults and nymphs feed on pollen and floral tissue, leading to flower abortion. Severe infestations can cause discoloration and stunted growth of the plant (Amin and Palmer 1985). However, indirect damage by Frankliniella schultzei is due to the virus transmission. Figure 7. 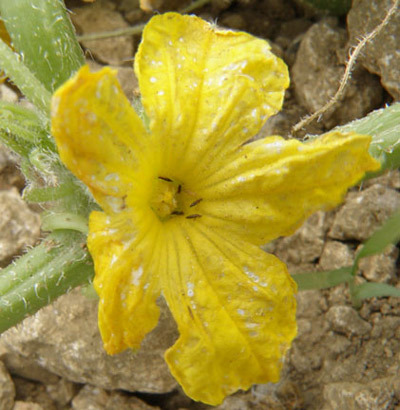 Cucumber flower showing decoloration due to feeding by adult common blossom thrips, Frankliniella schultzei Trybom. Photograph by Vivek Kumar, Entomology and Nematology Department, University of Florida. Figure 8. Distorted cucumber fruits due to feeding by the common blossom thrips, Frankliniella schultzei Trybom. Photograph by Garima Kakkar, Entomology and Nematology Department, University of Florida. Tomato spotted wilt virus (Tospovirus), is a serious virus causing damage to a wide range of plant species (Prins and Goldbach 1998). The tospoviruses can only be transmitted by thrips and in Florida, four species in the genus Frankliniella are responsible for the transmission of Tomato spotted wilt virus (TSWV). These are Frankliniella bispinosa, Frankliniella fusca (Hinds), Frankliniella occidentalis and Frankliniella schultzei (Mound 2004). The dark form of Frankliniella schultzei is known to vector at least four tospoviruses: TSWV (Sakimura 1969, Wijkamp et al. 1995) causing damage to tomato cropc in Brazil (Monteiro et al. 2001) and in Paraguay (Ishijima 2002); tomato chlorotic spot virus (TCSV); groundnut ringspot virus (GRSV) (Wijkamp et al. 1995) affecting several crops in Africa (Nakahara 1997); and chrysanthemum stem necrosis virus (Nagata and de Avila 2000). However, the pale form of Frankliniella schultzei is reported to be a weak vector of TSWV and TCSV and a non-vector of GRSV (Sakimura 1969, Cho et al. 1988). Recently in Florida, a new incidence of TCSV on tomatoes has been recorded and its spread has been associated with Frankliniella schultzei (Londoño et al. 2012). Sampling. Frankliniella schultzei is an anthophilous thrips species and is frequently found feeding on the flowers of its host plant (Kakkar et al. 2012). 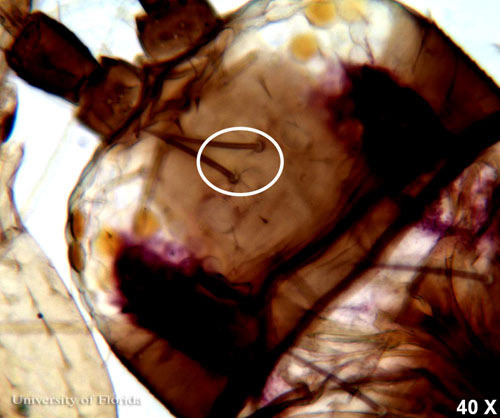 Like other thrips, Frankliniella schultzei can also be sampled using colored sticky traps. A study done in Australia reported sexual discrepancies among Frankliniella schultzei in color preference. In that study, male thrips were most attracted to yellow sticky traps while female thrips were more attracted to pink sticky traps (Yaku et al. 2007). Biological control. Two generalist predatory mites, Amblyseius cucumeris Oudemans and Amblyseius swirskii Athias-Henriot, known for their potential in controlling soft-bodied insect pests including thrips were tested against Frankliniella schultzei. The two mites fed voraciously in Petri dishes under laboratory and were found to have potential in suppressing Frankliniella schultzei. When tested in shadehouse and field conditions, the two mites species failed to control Frankliniella schultzei in the presence of other thrips inhabiting cucumber leaves. It is assumed that the two mites could be effective in controlling Frankliniella schultzei in single pest situations (Kakkar et al. 2016). Amin PW, Palmer JM. 1985. Identification of groundnut Thysanoptera. Tropical Pest Management 31: 268-291. Cho JJ, Mau RFL, Hamasaki RT, Gonsalves D. 1988. Detection of tomato spotted wilt virus in individual thrips by enzyme-linked immunosorbent assay. Phytophathology 78: 1348-1352. Hill DS. 1975. Agricultural Insect Pest of the Tropics and Their Control, Cambridge University Press, London. Ishijima, T. (ed.). 2002. Manual de técnicas de cultivo de hortalizas de fruta (tomate, melón, frutilla. National Institute of Agriculture, Caacupé, Paraguay. 240 pp. Kakkar G, Seal DR, Kumar V. 2012. 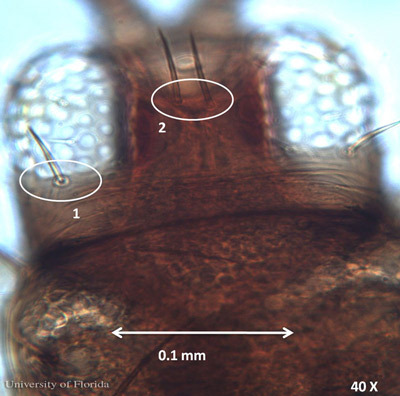 Assessing abundance and distribution of an invasive thrips Frankliniella schultzei (Thysanoptera: Thripidae) in South Florida. Bulletin of Entomological Research. 102: 249-259. Kakkar G, Kumar V, Seal DR, Liburd OE, Stansly PA. 2016. Predation by Neoseiulus cucumeris and Amblyseius swirskii on Thrips palmi and Frankliniella schultzei on cucumber. Biological Control. 92: 85-91. Londoño A, Capobianco H, Zhang S, Polston JE. 2012. First record of Tomato Chlorotic Spot Virus in the USA. Tropical Plant Pathology. 37: 333-338. Milne JR, Jhumlekhasing M, Walter GH. 1996. Understanding host plant relationships of polyphagous flower thrips, a case study of Frankliniella schultzei (Trybom). In Goodwin S, Gillespie P. (eds), Proceedings of the 1995 Australia and New Zealand Thrips Workshop: Methods, Biology, Ecology and Management, NSW Agriculture, Gosford. 8-14. Monteiro RC, Mound LA and Zucchi RA. 2001. Espécies de Frankliniella (Thysanoptera: Thripidae) de importância agrícola no Brasil. Neotropical Entomology 1: 65-71. Mound LA. 1968. A review of R.S. Bagnall's Thysanoptera collections. Bulletin of the British Museum (Natural History) Entomology. Supplement. 11: 1-181. Mound LA. 2004. Australian Thysanoptera - biological diversity and a diversity of studies. Australian Journal of Entomology 43: 248-257. Nagata T, De Avila AC. 2000. Transmission of chrysanthemum stem necrosis virus, a recently discovered tospovirus, by thrips species. Journal of Phytopathology 148: 123-125. Nakahara S. 1997. Annotated list of the Frankliniella species of the world (Thysanoptera: Thripidae). Contributions on Entomology, International 2: 355-389. Palmer JM. 1990. Identification of the common thrips of tropical Africa (Thysanoptera: Insecta). Tropical Pest Management 36: 27-49. Prins M, Goldbach R. 1998. The emerging problem of tospovirus infection and nonconventional methods of control. Trends in Microbiology 6: 31-35. Sakimura K. 1969. A comment on the color forms of Frankliniella schultzei (Thysanoptera: Thripidae) in relation to transmission of the tomato-spotted wilt virus. Pacafic Insects 11: 761-762. Vierbergen G, Mantel WP. 1991. Contribution to the knowledge of Frankliniella schultzei (Thysanoptera: Thripidae). Entomologische Berichten (Amsterdam) 51: 7-12. Wijkamp I, Almarza N, Goldback R, Peters D. 1995. Distinct levels of specificity in thrips transmission of tospoviruses. Phytopathology 85: 1069-1074. Yaku A, Walter GH, Najar-Rodriguez AJ. 2007. Thrips see red - flower colour and the host relationships of a polyphagous anthophilic thrips. Ecological Entomology 32: 527-535. Authors: Garima Kakkar, Fruit and alternative crops agent, UF/IFAS Extension St. Lucie County; Dakshina R. Seal and Vivek Kumar, Entomology and Nematology Department, University of Florida. Publication Date: July 2010. Latest revision: July 2017.